Lucky and The Mick from The Craptacular co-host with me this week! What do you think, Rushers? What new show are you most excited to see in the fall? Did you think the first Broadway in Bryant Park concert of the summer was a dud? Did you catch the re-revived Hair yet? Leave all your Craptacular thoughts in the comments below! Manhattan’s summer lunch breaks just got extended. There’s only one event that could justify an hour-and-a-half reprieve from the office, and that is the Broadway in Bryant Park concert series that kicked off Thursday afternoon. (Yes, my math is correct. The concert lasts an hour, but attendees should expect to get there at least a half hour early for a good seat.) Despite the gorgeous (if not intense) summer weather that beat down on the Bryant Park audience for the kick off installment, the concert series got off to an underwhelming start. Cirque du Soleil’s Zarkana was set to perform first. You might be wondering what act could be performed from the super-elaborate spectacle. The answer: not much. A couple minutes of clowns waddling through the sweaty crowd and a quick run across the stage comprised Zarkana’s bizarre performance—if you can call it that. The women of Baby It’s You! took the stage to show what a performance is really about. The four actresses that play the Shirelles pounded out a medley of the girl group’s hits, with Christina Sajous spunky vocals mixing well with her Rihanna-style cropped hairdo. The cheesy costumes of the 60s were not missed, and the performance demonstrated that the musical works so much better as a tribute concert than a narrative show. Cirque du Soleil has swooped back into New York in its second attempt to mount a successful semi-permanent show—Zarkana at Radio City Music Hall. After the financial and critical disaster that was last year’s Banana Shpeel at the Beacon Theater, the new spectacle, which opened Wednesday night, shows signs of many lessons learned. Banana Shpeel spun a ridiculous “who cares?” tale of a grouchy circus ringleader who’s had a bee in his bonnet for decades because of a past romance gone sour. The irritating plot left little stage time for the incredible contortionists, jugglers, and hand balancers that the audience had paid money to see. In Zarkana, a magician named Zark (get where the title comes from?) has lost his love and his magical powers. (Dude, bummer.) He spends the show lamenting about it in dramatic, rock-opera numbers, but leaves the stage for significant chunks of time, allowing the amazing soldiers of Cirque to do their thing. Less story, yes; but I could have done without Zark and his sad-sack story completely. Why does Cirque du Soleil feel so compelled to add narrative to their New York shows? Is it the presence of Broadway that makes them feel they need to compete? Broadway shows and Cirque-du-Soleil eye orgasms are apples and oranges. Cirque, leave the storytelling to Sondheim—show us the wow. What do you think, Rushers? Is Kate Shindle the perfect combination of beauty and humor? 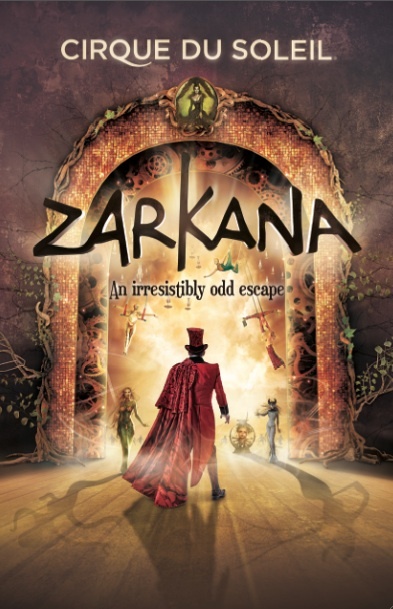 Do you think Zarkana is going to be one of Cirque du Soleil’s best shows, or another Banana Shpeel? Leave your thoughts in the comments below, and have a fantastic Memorial Day Weekend! Coming off the heels of the flop that was Banana Shpeel, which ran just over a month at the Beacon Theatre last year, the Cirque du Soleil company would not want to see the performers of their highly-anticipated new production flopping on safety nets. Yet that is what happened at a press preview Tuesday at Radio City Music Hall for the new show Zarkana. Four times, performers in the acrobatic-heavy show fell off their trapeze and onto the net below. “We all have bad days,” Zarkana’s creative director Line Tremblay said when she took the stage for a set of scheduled announcements from the Cirque du Soleil creative team. Tremblay appeared visibly embarrassed by the four falls, but writer/director Francois Girard followed her more confidently. “A few drops in the net is not going to stop us from showing you the best trapeze act,” Girard said. The production still has some time to tighten its act—previews begin June 9 with the show set to open June 29. It is scheduled to run through October 8.